There is a growing body of evidence that disturbances of glutamatergic neurotransmission may underlie the pathomechanism and cognitive deficits of Alzheimer's disease. This review describes the potential use of low affinity, noncompetitive NMDA receptor antagonists in the treatment of this disease using memantine as an example. Evidence is presented indicating that this class of compound is neuroprotective in preclinical models of sub-chronic glutamate toxicity without producing side effects characteristic for other classes of NMDA receptor antagonist. This is attributed to their fast blocking kinetics and strong voltage dependency. Memantine also produces symptomatological improvement of cognition in animal models. The mechanism of action of this effect is still unclear but might be related to an enhancement of AMPA receptor mediated neurotransmission. 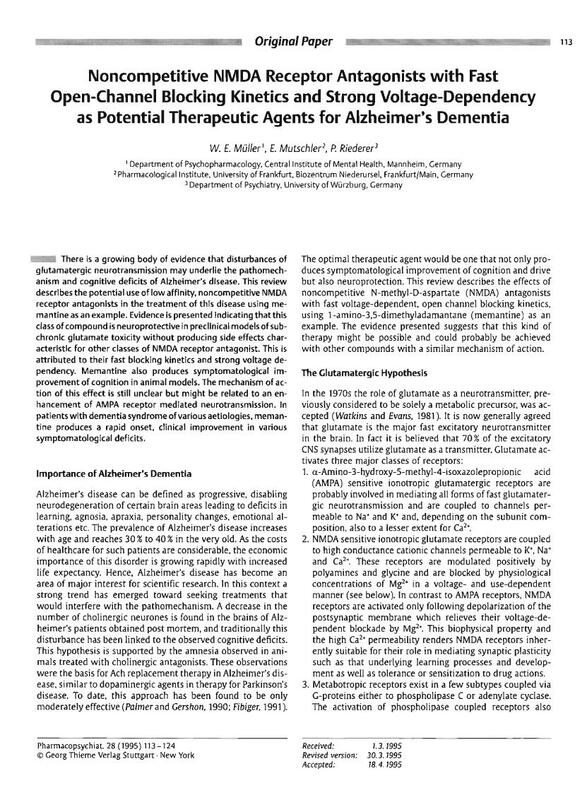 In patients with dementia syndrome of various aetiologies, memantine produces a rapid onset, clinical improvement in various symptomatological deficits.